Enough of the imbalance that is causing the degradation of our environment, the demise of our democracies, and the denigration of ourselves. Enough of the pendulum politics of left and right and paralysis in the political center. We require an unprecedented form of radical renewal. 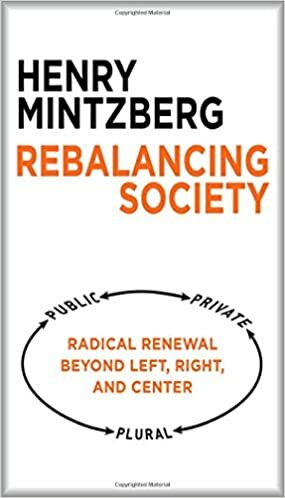 In this book Henry Mintzberg offers a new understanding of the root of our current crisis and a strategy for restoring the balance so vital to the survival of our progeny and our planet. With the collapse of the communist regimes of Eastern Europe, Western pundits declared that capitalism had triumphed. They were wrong—balance triumphed. A healthy society balances a public sector of respected governments, a private sector of responsible businesses, and a plural sector of robust communities. Communism collapsed under the weight of its overbearing public sector. Now the “liberal democracies” are threatened—socially, politically, even economically—by the unchecked excesses of the private sector. Radical renewal will have to begin in the plural sector, which alone has the inclination and the independence to challenge unacceptable practices and develop better ones. Too many governments have been co-opted by the private sector. And corporate social responsibility can't compensate for the corporate social irresponsibility we see around us “They” won't do it. We shall have to do it, each of us and all of us, not as passive “human resources,” but as resourceful human beings. Tom Paine wrote in 1776, “We have it in our power to begin the world over again.” He was right then. Can we be right again now? Can we afford not to be?